Contact us for Arborist on site evaluations and reports. 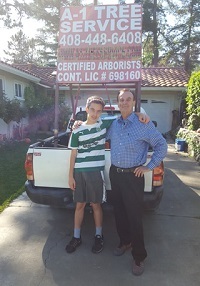 A-1 Tree service, Inc. ( a California Corporation ) is a full service company offering professional and dependable trimming, pruning, moving, removal, stump grinding, and arborist services in silicon Valley. We are a family company with more than 32 years of experience in the tree service business and we offer fast, friendly, personal service throughout the Greater San Jose Area. Our Professional work is fully guaranteed and we are licensed and bonded to give you complete peace of mind. Don't be fooled by other services who copy or imitate our name, trust in our reputation. We have earned it by working here since 1979, you can check our reviews. If you are looking for a professional tree services company that is Licensed Bonded and Insured, then you have come to the right place! We are well known in silicon Valley for our quality work, reasonable prices and fast response . We guarantee the highest tree care standard for our customers, and we always put your needs first. Rest assured that your trees and property are in the hands of well trained tree care professionals. Our estimators have years of experience in the tree care business, and can evaluate your trees and make recommendations with confidence. We have a staffed Certified Arborist. We are ready to address your every tree care need including emergency services.